Sharon Lockwood (left) is Sonia, Heather Alicia Simms (center) is Cassandra and Anthony Fusco is Vanya in Christopher Durang’s Vanya and Sonia and Masha and Spike, the season opener for Berkeley Repertory Theatre. Below: Mark Junek (center) as Spike does a reverse striptease, much to the shock/delight of Fusco as Vanya, Caroline Kaplan as Nina and Lorri Holt as Masha. Photos courtesy of kevinberne.com. If you spend any time at all going to theater in the San Francisco Bay Area, you soon see that we have some extraordinary homegrown talent populating our local stages. That’s not empty boosterism – rah, Bay Area! – but something nearing actual fact – rah, working Bay Area actors in it for the long haul! In just the last month or so, Marin Theatre Company, TheatreWorks, Aurora Theatre Company, American Conservatory Theater and Magic Theatre have opened their seasons with at least one dazzling, shake-your-head-in-wonder performance by a Bay Area actor. 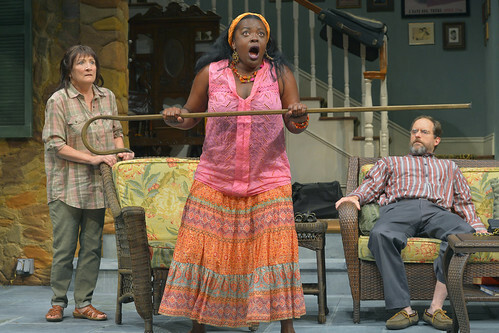 Now Berkeley Repertory Theatre gives a triple scoop of local actor goodness in Vanya and Sonia and Masha and Spike, the local premiere of Christopher Durang’s Tony Award-winning comedy. Playing the titular siblings, whose community theater-actor parents had a thing for Chekhov, are Anthony Fusco as Vanya, Sharon Lockwood as Sonia and Lorri Holt as Masha. Watching these three seasoned pros work together is a joy, to put it mildly. They have craft and nuance and real connection (with the audience and each other), and it genuinely feels like they’re having fun up there together. Granted, Durang’s play, though rooted in the world of Chekhov and tinged with some of the same sadness borne of lives barely lived, is a jaunty vehicle for the talents of great actors. In this world, everybody is carbonated, some more than others, and everybody gets a chance to, if you’ll pardon the expression, pop their cork. At the start, it would seem that Vanya and Sonia, now living in the country home they grew up in following the long, slow death of their parents, have absolutely no fizz left in them at all. Vanya is reasonably content – watch him take simple joy in a good cup of coffee and sunrise from the morning room – but Sonia is a lament on legs. Life has passed her by, and at 52, she has nothing to live for. She is, in effect, mourning her life in the morning room. To continue the Chekhovian theme, a winsome, starstruck young lady from across the pond (literally, across the pond just outside the house) comes wandering over hoping to meet the famous Masha. Her name is Nina, naturally, and she ends up performing in a play Vanya (whom she calls Uncle Vanya just to clarify, for anyone who might be asleep, that Chekhov is the godfather of this comedy) has written, inspired by a scene from The Seagull. Veering entirely away from Chekhov, Durang also throws in a cleaning lady named Cassandra (Heather Alicia Simms) who, like her namesake, has the power to foretell the future. In her case, though, the system is a little herky-jerky, but she gets it right a lot of the time. More the point, whenever she goes into a trance or brings voodoo into the mix, the audience goes wild with joy because Simms is so much fun to watch. Director Richard E.T. White, returning to Berkeley Rep after an almost 20-year absence, knows that this is a light play. There are shadows to be sure, and some of it is almost poignant, but for nearly three hours, the experience is about the laughs and the mash-up of highbrow Chekhov and lowbrow pop culture and, most of all, the moments when the characters explode in effervescent bursts. Fusco’s moment comes in the second act when Vanya has a major flip-out and decries everything about the present in favor of the gentler past. It’s a masterful tirade, and Fusco gives it all he’s got. Holt’s vainglorious Masha has multiple snit fits, not the least of which involves a costume part, her Snow White costume and a demand that everyone else be dwarfs (Spike at least gets to be Prince Charming). But perhaps Holt’s funniest moment comes when Masha attempts to realign her aura from the negative to the positive – or as positive as Masha can get. Lockwood’s Sonia is, simply, a dream. Debbie Downer for the first part of the play, Sonia comes to life at the costume party when she makes herself pretty and sparkly and starts speaking in an imitation of Dame Maggie Smith in Neil Simon’s California Suite (for which she won an Oscar playing an actress who loses the Oscar). We watch Sonia come to life – she is re-carbonated, and it’s a beautiful thing. The entire cast is a delight, but there’s special pleasure in watching Fusco and Lockwood and Holt bring their unique talents to bear in Vanya and Sonia and Masha and Spike, a zany family comedy with the zing of sparkling wine and, thanks to marvelous actors, the occasional tang of real champagne. I talked to playwright Christopher Durang for a story in the San Francisco Chronicle. Read the feature here. Christopher Durang’s Vanya and Sonia and Masha and Spike continues an extended run through Oct. 25 at Berkeley Repertory Theatre’s Roda Theatre, 2015 Addison St., Berkeley. Tickets are $29-$89 (subject to change). Call 510-657-2949 or visit www.berkeleyrep.org.